August 7, 2012— Renowned Santa Fe artist Krista Brooks of Retro Pets created this delightful assistance dog image. 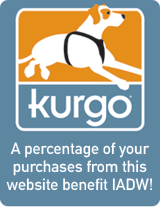 It has been applied to T-shirts and other products so you can show your support of IADW. 100% of the profits from sales of these items on Cafe Press will benefit International Assistance Dog Week. You can shop for the T-shirts and other items at the Assistance Dog Week Café Press store. You may also purchase 8×10 and 11×14 art prints of this image from the Retro Pets website. 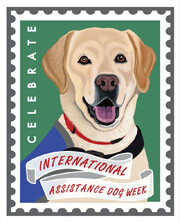 Retro Pets will donate 50% of the retail price of Assistance Dog Art prints to International Assistance Dog Week! By purchasing a product featuring this Retro Pets “work of ARF,” you will be helping to spread the word about all the devoted, hardworking assistance dogs and helping to grow the annual event.